We occasionally make trades for collectible and/or high quality firearms. Inquire if interested. make these Owen cues an incredible choice! Read recent interview with Bob in the "Cuemaker Interview" section of this site. FOUR BEAUTIFUL NEW BARNHARTS NOW IN STOCK. ♦ REDHEART MERRY WIDOW (Details) New Listing! 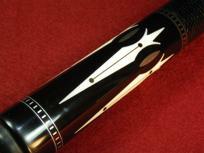 ♦ EBONY "GUITAR MAN" CUE (Details) New Listing! SORRY, BREAK CUES SOLD OUT. ♦ FULL SPLICE "SHARK TOOTH"
These cues are known for their playability. WRAPLESS CUE (Details) Sale Pending! Variation on Model 14D (Details) Sold! BE ADDED TO WAIT LIST. 2018 Cuemakers Choice "Cue of the Year"
♦ JUMP/BREAK CUES - OUT OF STOCK. NONE AVAILABLE! No Blackcreeks in stock at this time. No Drexler cues in stock at this time. You've been asking for these!! A classic, collectible cue by one of the best. No Scruggs cues in stock at this time. Don't forget we sometimes accept trades of guns for cues and cases. Guns must be collectible and/or high quality firearms. The transaction must go through a FFL Licensee. Inquire if interested. Tell us what you have and what you'd like to trade for. We may be able to work out a deal that is good for both of us. ♦ JB Classic Compact 2X4s (Details) Only one left! Pockets and Trim (Details) Sold!